"You are Captain Comic, galactic hero. Your mission is to recover three treasures from the planet Omsoc, which have been stolen away and hidden on the remote planet of Tambi." Captain Comic is a solid platformer featuring a huge nonlinear playfield divided into several different terrains. As Comic, you must search throughout Tambi for powerups and items that will aid you in your quest to recover the three treasures. The Captain's main weapon is 'Blastola Cola', a can of drink that allows him to hurl fireballs at his foes. For each can that he finds, an addtional fireball can be thrown. There are many different paths that are available from the start, but without the right item or weapon, it can be impossible to progress through certain paths, or even suicide. It's up to the player to decide the correct route to take, and which places to return to at a later time. Captain Comic and its sequel are competent shareware platformers in an era where the shareware scene was dominated by Apogee and Epic Megagames (and still is, to a lesser extent). The best things about the game is the huge non-linear playfield which is divided into several different terrains. As Captain Comic, galactic hero, you jump from platform to platform and collect all kinds of bunos treat. Your only weapon is your blaster, which can fire a varying number of shots depending on how many blastola colas you've collected. Other items you can find include the pickaxe, jet pack, magic wand and other little trinkets. The graphics are EGA only and not as detailed as Apogee's platformers, but they are more than sufficient. There is also an element of puzzle-solving (e.g. finding this or that treasure, exit to the next level, etc.) thrown into the mix to make the game more challenging. Overall, both games above-average platformers that action fans should take a look, although they are far from being comparable to Apogee's classics in breadth or depth. It was one of the first side-scrolling games made for the IBM PC. 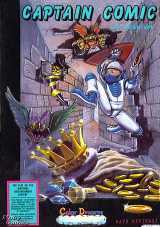 The game was later given away for free (as an incentive for the commercial sequel, Captain Comic II: Fractured Reality).